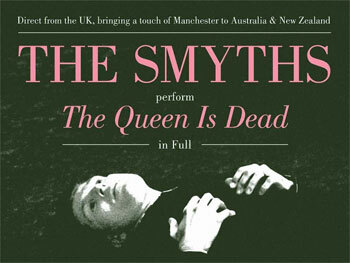 Though their muse never made it to our shores, The Smyths today announce their impending arrival in celebration of The Queen Is Dead turning 32, bringing with them the sound, the feel and ultimately, the spirit of one of the greatest, and most influential rock acts of all time, The Smiths. Released in June of 1986, The Queen Is Dead was welcomed into a world riddled with social change. The record perfectly tells the tales of struggle, ambition, love, loss and drama that were widespread during the era. Indeed, The Queen Is Dead is every bit as needed today as it was 32 years ago. The Queen Is Dead gave the world timeless tracks including 'There is a light that never goes out' , 'Big mouth strikes again', 'The boy with the thorn in his side' and 'I know it's over'. The Smyths will be performing the album in full, as well as a special encore of Greatest Hits. The Smyths have been retelling classic moments from The Smiths songbook including 'This Charming Man', 'Heaven knows I'm miserable now', 'Hand in glove', 'William, it was really nothing', 'Panic' and 'How soon is now'. Leaving the wigs and props in their cases, The Smyths have been tagged as the foremost tribute to The Smiths for their authentic renditions, fussed over and polished as only devotes of The Smiths could do. Fans of their namesake before anything else, The Smyths make a point of rehearsing every week to remain as genuine as possible to the real thing. The Smiths are inimitable, The Smyths know that. But it doesn't stop them from exhuming an evening brooding, jangle pop charm that only Morrissey was able to before.